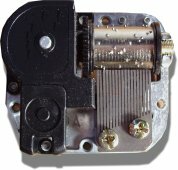 This is a 1 tune 18 note clockwork music box standard movement. A movement ideal for small projects and music boxes. Wound from underneath with a removable key (which is supplied). Please note the movement is pictured with a wire brake mechanism. This is available as an optional extra. Music Box Metal Turntable 221/146/03 and Music Box Top Mount Rotation Assembly. 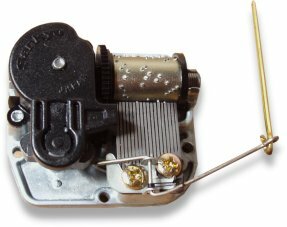 This movement is also suitable for use with the metal disc turntable that attaches to the threaded key shaft at the base of the movement. Approx Size 50 x 44 x 20mm (2" x 1 3/4" x 3/4"). Total playing time until fully unwound: 3 - 4 minutes approx ( repeating tune).